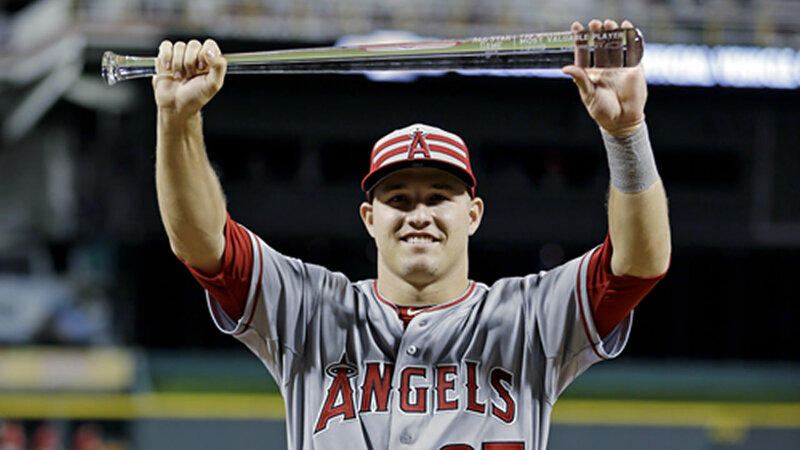 Mike Trout became the first player in 38 years to lead off the All-Star Game with a home run, and the American League beat the National League 6-3 Tuesday night to secure home-field advantage in the World Series for the third straight year. Prince Fielder singled in the go-ahead run in the fifth inning off loser Clayton Kershaw, joining Trout in completing career All-Star cycles. Only 10 players in 86 midsummer classics have a career cycle. Fielder added a sacrifice fly, Manny Machado doubled in a run and Brian Dozier homered for the AL in the fifth All-Star Game played in red-clad Cincinnati and first at the Great American Ball Park. Trout went opposite field off Kershaw's teammate Zack Greinke on the fourth pitch of the game, giving the four-time All-Star a unique feat: he has a single, double, triple and homer - in that order - in his first four initial trips to the plate in his All-Star appearances. David Price struck out two in an inning for the win. Cincinnati Reds closer Aroldis Chapman struck out the side in the top of the ninth inning and the National League gets one more chance to try to make a comeback in the All-Star Game. The AL leads 6-2 going into the bottom of the ninth on Tuesday night. Chapman wowed his home crowd in the top of the ninth, striking out the side with fastball after fastball each going over 100 mph. He topped out at 103 mph while striking out Brock Holt, Mike Moustakas and Mark Teixeira. Glen Perkins is replacing Wade Davis to try to finish the win for the AL. The National League has only one more chance to try to prevent their American League counterparts from winning home-field advantage in the World Series. Going into the ninth inning, it's 6-2 AL. Wade Davis pitched a scoreless eighth inning, helped by shortstop Jose Iglesias with a nifty play to throw out pinch-hitter Yasmani Grandal. Mark Melancon got off to a great start to the top of the eighth, striking out Brett Gardner and pinch-hitter Russell Martin, but the last player added to the All-Star roster, Brian Dozier, then homered to put the AL up by four runs at 6-2. Dellin Betances walked rookie Kris Bryant in a scoreless bottom of the seventh. After seven innings, it's AL 5, NL 2. The AL added two runs in the top of the seventh inning of the All-Star Game against Francisco Rodriguez, taking a 5-2 lead into the seventh-inning stretch. Manny Machado had an RBI double off the wall in right-center and Prince Fielder a sacrifice fly for his second RBI. Rodriguez walked leadoff batter Mike Trout. The reigning AL MVP became the first starter to have four plate appearances in an All-Star Game since Jose Reyes in 2007. Chris Archer got Todd Frazier to ground out after Andrew McCutchen homered to cut the lead to 3-1, then was lifted for Zach Britton. He struck out Bryce Harper, who ditched the batting gloves for his third at-bat. Paul Goldschmidt reached when Britton pulled Albert Pujols off first base for an error with a poor throw. Yadier Molina singled to center but Troy Tulowitzki hit a grounder to second baseman Jason Kipnis, who flipped to shortstop Jose Iglesias for the final out. After six innings, the AL leads 3-2. Mike Trout isn't the only player to get the career All-Star cycle on Tuesday night. Prince Fielder's RBI single in the fifth inning gave him all four types of hits in the midsummer classic. He's a six-time All-Star. That makes 10 career cycles all-time in MLB history. Trout is the only one to get a different type of hit in his first four first at-bats. On the first pitch in the bottom of the sixth inning in the All-Star Game, Andrew McCutchen made it a one-run game. The Pirates star launched a home run off a knee-high fastball into the left field seats. Jacob deGrom struck out the side in the top half of the sixth, reaching 98 mph on his fastball. Pinch-hitter Prince Fielder and Lorenzo Cain had consecutive RBI singles in the fifth off Clayton Kershaw to put the AL up 3-1 in the All-Star Game. Chris Archer then walked Jhonny Peralta with one out in the bottom half but easily finished off the NL. Home Run Derby finalist Joc Pederson struck out for the second time in the game. With rain still in the forecast, this game is official - don't forget the result count to determine home-field advantage in the World Series. After five innings, it's AL 3, NL 1. Madison Bumgarner got himself in a little jam, giving up a soft single to Lorenzo Cain then throwing a wild pitch while striking out Salvador Perez with two outs in the top of the fourth. Perez reached and Cain raced to third base. Jose Altuve grounded out to end the inning. Interesting official scoring call in the inning: with Cain running on the two-out pitch, he gets credit for a stolen base. He advanced to third on the wild pitch. David Price has a 1-2-3 bottom half, striking out two. After four innings, it's still AL 1, NL 1. Gerrit Cole pitched a clean third inning for the NL in the All-Star Game on Tuesday night. He walked Josh Donaldson - the Blue Jays' second free pass of the night - with two outs but Albert Pujols flied out to center fielder Andrew McCutchen. Felix Hernandez took over for Keuchel in the bottom half and was perfect. After three innings, it's AL 1, NL 1. Madison Bumgarner, known around baseball as "MadBum," is next. David Price and the silver shoes warm up for the AL. A little on Mike Trout's All-Star success: He's played in the midsummer classic in each of his first four full seasons, and he's hit for the cycle with his first at-bats in the four appearances - and in order. He's got a single, double, triple and now a homer. He's the ninth player to hit for the cycle in All-Star history, according to STATS. He's in pretty good company: Ernie Banks, George Brett, Roberto Clemente, Steve Garvey, Willie Mays, Mike Schmidt, Lou Whitaker and Ted Williams. Sure-handed Josh Donaldson's throwing error on leadoff batter Paul Goldschmidt's infield hit helped the NL even things up in the All-Star Game on Tuesday night. Two outs after Goldschmidt hit a soft grounder down the third base line and Donaldson's throw sailed over Albert Pujols' head, Johnny Peralta blooped a single to right field for an RBI. After two innings, it's AL 1, NL 1. Grienke found his groove retiring the side in the order in the second inning of the All-Star Game on Tuesday night. He struck out four of his last six batters. Looks as if Gerrit Cole is next. He's warming up in the bullpen. A clean first inning for bushy-bearded Dallas Keuchel in his first All-Star Game. The AL shifted for lefty-swinging Bryce Harper and he grounded to the shortstop, where third baseman Manny Machado made the play. After one inning, it's 1-0 AL. And Zack Greinke throws the first pitch in Tuesday night's All-Star Game to Buster Posey in a gold catching helmet at 8:32 p.m.
Three pitches later, Mike Trout sends a low and away pitch over the right field wall for the first leadoff homer in an All-Star Game since Kansas City's Bo Jackson in 1989 at Anaheim, when he got things started well in the bottom of the first. That, by the way, would be the first run off the Dodgers righty since June 13. Not to worry, these stats don't count and Greinke's streak is still going. After Sandy Kofaux threw the ceremonial first pitch off a rubber placed about 45 feet from home plate to Johnny Bench wearing a red and black gloves the two items were immediately taken to the authentication station in an area next to the National League dugout. Kofaux and Bench were on the field along with Hank Aaron and Willie Mays as the winners of MLB's Greatest Living Player vote. Looks as if Cardinals closer Trevor Rosenthal is going to sit out his first All-Star Game. The right-hander has a sore arm and is probably not going to pitch on Tuesday night. The right-hander appeared in four of the Cardinals' last five games, throwing 1 1/3 innings on Saturday. Rosenthal gave up four runs and seven hits combined in two outings at Pittsburgh going into the break. As the players lined up for the introductions it became immediately apparent that many of the regular-season dress codes are set aside for the All-Star Game - so players can show some flair. Several are wearing fluorescent arm sleeves on Tuesday night. San Diego outfielder Justin Upton had a red and black sleeve. Many of the players that have shoe deals with Nike were wearing spikes that seem to glow in orange, lime, blue or yellow. Tigers pitcher David Price's silver kicks sparkle, and Oakland catcher Stephen Vogt's gold and green surely stands out. Pete Rose came home for the All-Star Game and made a rare on-field appearance in the one place where he's still treated like a king. The hits king was voted one of the Cincinnati Reds' Franchise Four players as part of a Major League Baseball promotion. Rose and Hall of Famers Johnny Bench, Barry Larkin and Joe Morgan were introduced on the field at Great American Ball Park before the All-Star Game on Tuesday night. The 74-year-old Rose was last out of the AL dugout. He was banned for betting on baseball in 1989 and has a longstanding application for reinstatement pending. New Commissioner Rob Manfred said on Tuesday that he hasn't yet scheduled a meeting with Rose to discuss it. The NL All-Stars used the Reds clubhouse, and one locker assignment brought a few smiles: Cardinals catcher Yadier Molina was assigned to Brandon Phillips' locker. In 2010, the Reds second baseman angered the Cardinals by calling them a derogatory name in an interview. He tapped Molina's shinguard while leading off the next day as a sign of friendship, and Molina took exception. A brawl between the teams ensued. Phillips still gets booed when he plays in St. Louis, and Molina gets the same treatment in Cincinnati. Told that he was assigned Phillips' locker on Tuesday, Molina laughed and said, "It is? I should write something for him. It's funny. You think they did that on purpose? I don't mind. He's a great player." Molina says the two of them have made amends over the years. Reds third baseman Todd Frazier is feeling the effects of winning the Home Run Derby. He hit 15 homers in the final round for his first crown on Monday night, capping a night that included nearly 15 minutes of swinging for the fences. He said that's a lot of swings. Frazier got more than 300 congratulatory texts. A storm that passed through the area shortly after the derby ended left thousands of people without electricity, including Frazier. It hadn't yet been restored to his home when he left for the ballpark on Tuesday. Tampa Bay's Chris Archer was awed by the players' parade through the streets of downtown Cincinnati. He says he almost started to tear up while riding in a pickup, hearing his name being called by fans. The first-time All-Star says "just being here is crazy." The sun is out, the tarp is off the field and the Reds grounds crew is setting up the batting cage. Overheard in the AL clubhouse, though, was one official urging the players to hurry onto the field for their team photo before more rain comes. This could be a long night, folks. Congratulations, you're an All-Star. Now sign this. One of the main responsibilities of all the All-Stars, it appears, is to put their signature to memorabilia. Some will be sold or auctioned for charity and some are for teammates. Don't get a cramp in your hand. NL players were asked to put their signature to 41 boxes of balls (a dozen per box) - 18 of them at the entrance to the showers. Also, 21 players put out their jerseys Tuesday for signing and there were also 18 NL All-Star jerseys set on a table running the length of the clubhouse. On another table there were four red-and-white gloves and 37 red-and-white All-Star bats plus six regular bats for signing. Max Scherzer also put out three giant black mattes that will be fitted with photos after the game. The AL players only had it slightly easier: There were 17 boxes of balls, 15 All-Star jerseys and 20 team tops, and 32 red-and-white bats with one red-and-black piece of lumber. A line of strong storms rolling through Cincinnati could make the All-Star Game a wet affair. Weather officials say the rain is expected to taper off by the scheduled 8:15 p.m. start of the game on Tuesday night, but showers are possible through the evening. A severe thunderstorm watch and flash flood watch are in effect until 8 p.m. for much of southwest Ohio. Severe thunderstorms moved through the area late Tuesday afternoon, with extremely heavy rain at Great American Ball Park. Here comes the rain. The sunny morning with streets filled with red-clad fans has suddenly turned into a colossal summer storm ahead of the All-Star Game on Tuesday night. Wind is blowing, the tarp is out and visibility at Great American Ball park is so bad, the Ohio River beyond the outfield isn't visible from the press box. A new format and Todd Frazier's performance in the Home Run Derby that electrified the home crowd helped bring in big overnight ratings for the event. ESPN's telecast got a 4.9 rating, up 26 percent from last year's derby in Minnesota that received a 3.9. With all the talk this week about Pete Rose, banned from baseball for gambling on the Reds when he was their manager, it only makes sense to ask Commissioner Rob Manfred about baseball's relationship to Draft Kings. The daily fantasy baseball site pays cash to winners who wager on nightly lineups (you've seen all the ads plastered around ballparks this season, right?). Manfred says he's made clear to players and front office personnel that playing daily fantasy sports isn't appropriate for them. But he says baseball sees a clear distinction between people who can affect the outcome of a game and fans who want to engage through daily fantasy sports. The players union is keeping tabs on the new association with the website. Union head Tony Clark said Tuesday at the Baseball Writers' Association of America meeting that they're walking a very delicate line that can easily be muddled. How's this for quick: MLB is running an advertising campaign this season meant to attract a more youth-orientated audience using the hashtag #THIS. In addition to spots focusing on young stars such as Mike Trout, Yasiel Puig and Chris Archer, the league has been running ads based on specific moments on the field. Todd Frazier earned his own ad for his win in the Home Run Derby in front of his home fans Monday night, just a few hours after he knocked out Joc Pederson in the final round. MLB Commissioner Rob Manfred says there is no meeting set yet with Pete Rose, who remains a celebrated presence in Cincinnati. Players' association head Tony Clark later says the commissioner will make the decision about whether Rose should be re-instated but he feels it's "a travesty" that whenever Rose is brought up in baseball conversation, it's tied to his banishment. Clark would not give his opinion on whether Rose should be re-instated. The head of the MLB Players Association turned to the NFL for an example when asked about his concerns on releasing more medical information to teams ahead of the MLB draft. Tony Clark says it's a "travesty" that medical records belonging to defensive end Jason Pierre-Paul were apparently leaked to the public after the New York Giants star had a fireworks accident on July 4. Clark says giving unmitigated access to such information is a problem when it shows up in blogs and social media. He says "opening a Pandora's Box and hoping everyone plays nice in it is not something we are interested in doing right now." - Manfred said no changes to address fan safety are coming soon. The subject has been a hot topic since a woman in Boston was hospitalized after being struck by a flying bat. MLB is still evaluating ballpark safety features and, if there are any changes, they will be implemented before next season. - Strike three! Asked if umpires are calling a lower strike zone, Manfred deferred to Torre, who is in charge of on-field operations. Conspiracy theorist fans can rest easy, Torre said there's been no change in strike zone compared to last year. Two years ago umpires began calling lower strikes. Torre insisted there has been no effort to call more strikes overall to speed up pace of play. - Manfred says the commissioner's office is continuing to work on a new domestic violence policy and will have an announcement shortly. MLB Commissioner Rob Manfred says he's encouraged by pace of play changes and reports that games are moving along better. He told reporters on Tuesday before the All-Star Game in Cincinnati that it's hard to ignore that the average game time is down 9 minutes, even though average length of game was not the priority in speeding things up. Manfred says the most important issue involving pace of game is player support. He says he's talked to 29 of 30 teams about pace. MLB Players Association head Tony Clark doesn't sound too interested in using the clock in the bigs. He says the clock's success in the minors has no bearing on how it would work in the big leagues. Don't count on any postseason expansion in MLB. Commissioner Rob Manfred said Tuesday before the All-Star Game in Cincinnati that he likes baseball's playoff format, including the one-game play-in for wild-card teams. He says the selectivity of baseball's postseason is one thing that sets the game apart from other sports. One instance in which fans may get their best-of-three wild-card series is if MLB goes to a shorter schedule someday - perhaps after 2016 collective bargaining. It would be one way to offset revenue losses from the regular season. On league expansion, Manfred says he thinks MLB is a growth business. He says he's open to the possibility of expansion at some point. But he says it's a long way from two exhibitions to 81 home games in a facility that meets major league standards. It's All-Star Game day and the sun is shining on Cincinnati - although thunderstorms are in the forecast for game time (8:15 p.m.) at Great American Ball Park. It's a sea of red in the streets of downtown Cincinnati as fans start to line up for the All-Star parade. Commissioner Rob Manfred is going to hold a Q&A with members of the Baseball Writers' Association of America.